Often the overlooked cousin city of Copenhagen, Aarhus, the second biggest city in Denmark, should make it to the top of people's list when they come to Denmark. 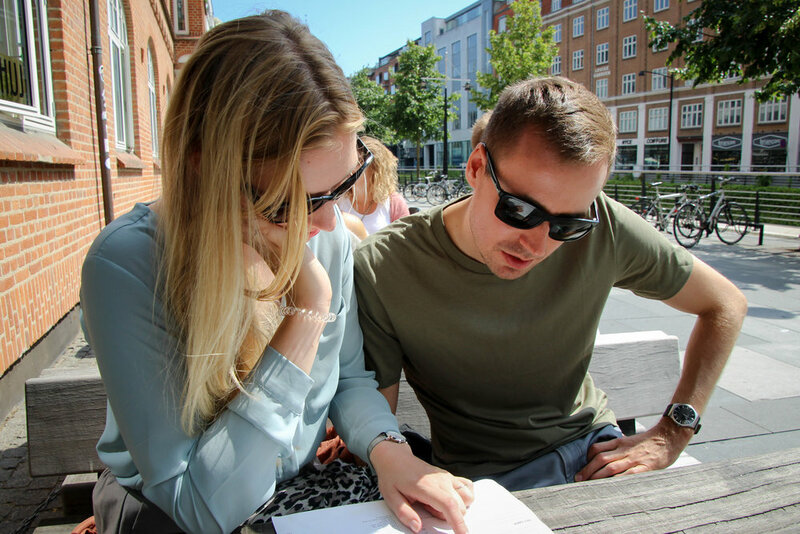 David Nielsen, chef and founder of Food Walk, piloted me and a group of Danes through the city, to show us why Aarhus was awarded two coveted titles in 2017: 'The European Region of Gastronomy" AND "Europe's Capital of Culture". For four hours, we zigged and zagged through the city so that we could sample a smorgasbord of the city's tasty food and beverage offerings. 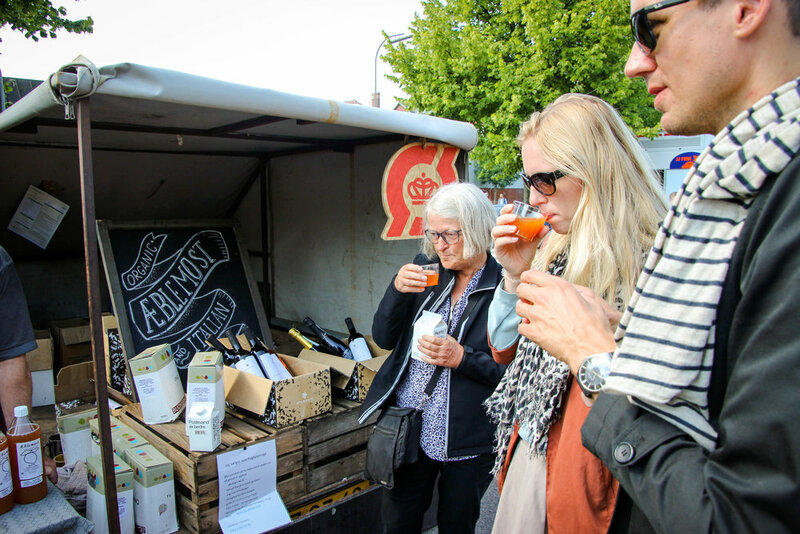 We started the tour off at Ingerslevs Boulevard, where you will find Denmark's largest food and vegetable farmer's market. The market operates every Wednesday and Saturday year round, rain or shine, and the foods available are in sync with the seasons. 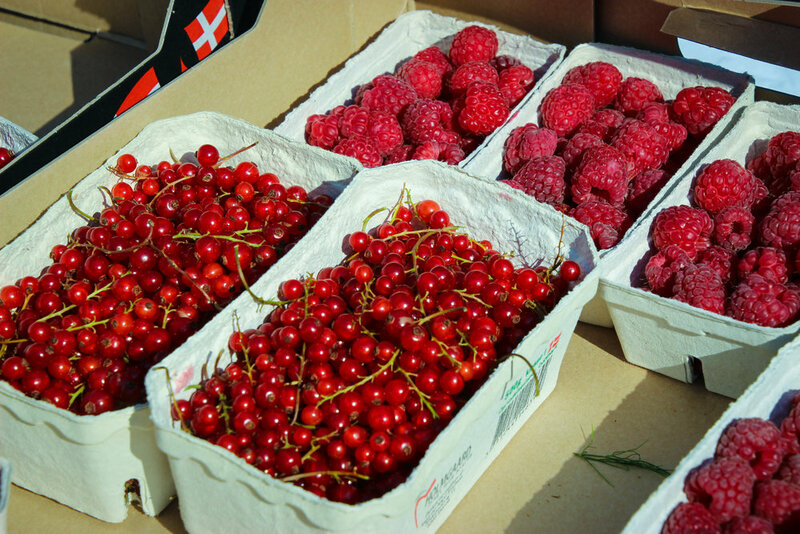 Being summertime in Aarhus, the market beamed with glistening lingonberries, new potatoes, and young cheeses. Elderly folk and toddlers alike sat around licking ice cream cones and making small talk as others walked and ate their way through the market. 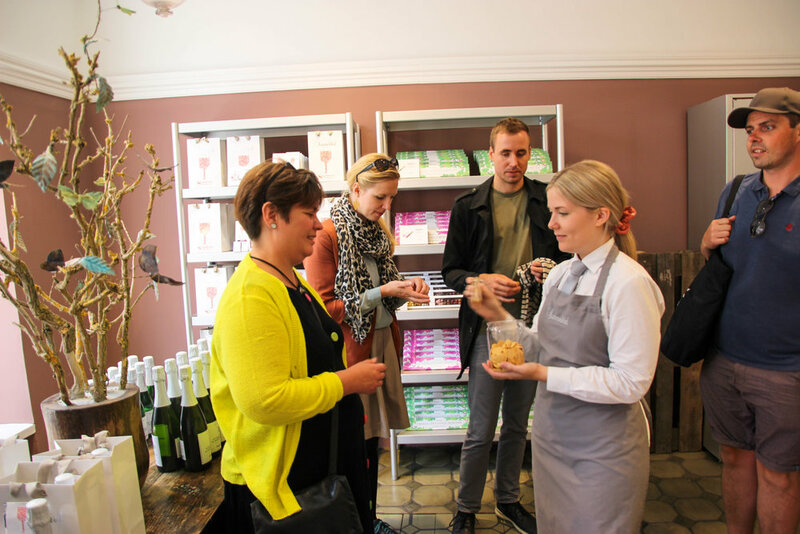 We began our tour sampling some classic Danish block cheeses. These cheeses typically do not have a name; instead, they are referred to by their fat content- this is not a nice way to refer to people, but perfectly fine for labeling cheeses in Denmark. The cheeses can also be sorted by their strength in taste or texture. We tried three Danish cheeses: 1) 45% fat from cow's milk, 2) Strong & Creamy, 3) The Most Potent. We also tried a French cheese and Dutch Gouda with pesto. 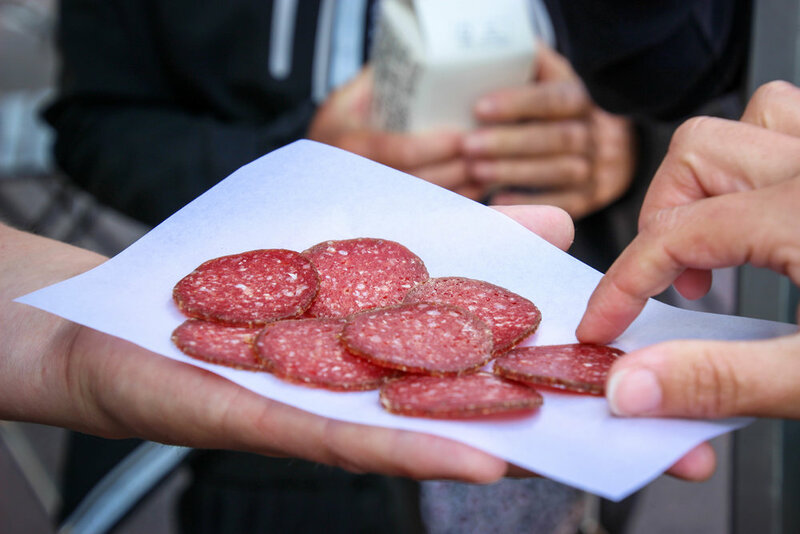 Moving along to the next vendor in the open-aired market, we tried some cured meats. There are 5 pigs for every Dane, so naturally, they eat a LOT of pork. 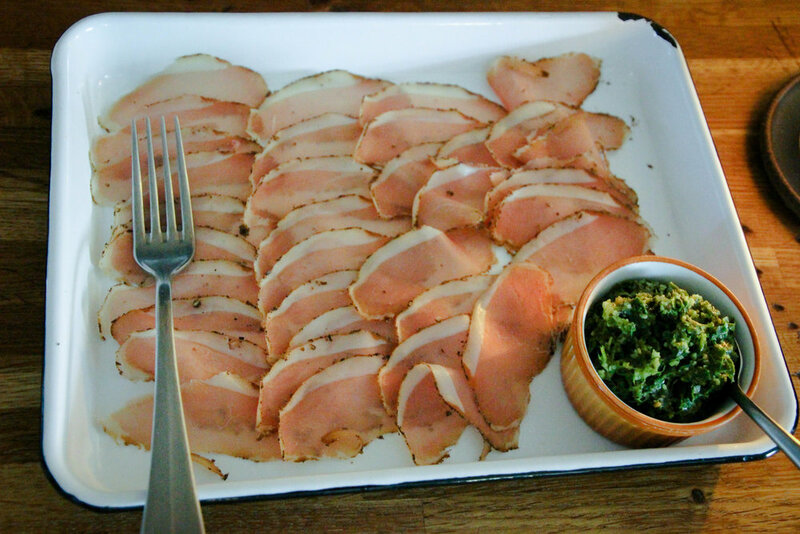 Approximately 90% of all pork raised in Denmark is exported, so it is also an essential part of the economy. Danes typically follow high standards or animal welfare when raising their pigs, and that comes through in the taste. Swine is king here, and there are seemingly endless ways to prepared and eat it. Our third stop in the market was Aeblemost. This is the name of a small farm approximately 45 minutes outside of Aarhus, that is known in this market for its fresh-pressed apple juice. The farmer hand picks the apples, never letting them hit the ground, and has several varietals on his modest plot of land. He has summer apples, light in color and supremely sweet, that ripen in 2 weeks. He also has winter apples, which can be stored for 6 months and are much more tart and musty colored. We sampled the cold pressed juices of these two apple varietals side by side. Equally delicious and very different, you cannot go wrong with either - but trying both is definitely the way to go. While Denmark exports a lot of their pigs to Spain, they have "imported" many food preparation techniques from the Spanish. At Sårt, our first stop outside of the market, we stepped into a room full of cured meats left hanging to mature and deepen their flavor profiles. They use no nitrates to cure their pork; instead, enzymes and salt are added to the meat to grow "good bacteria" - this is a common curing technique done in Spain. 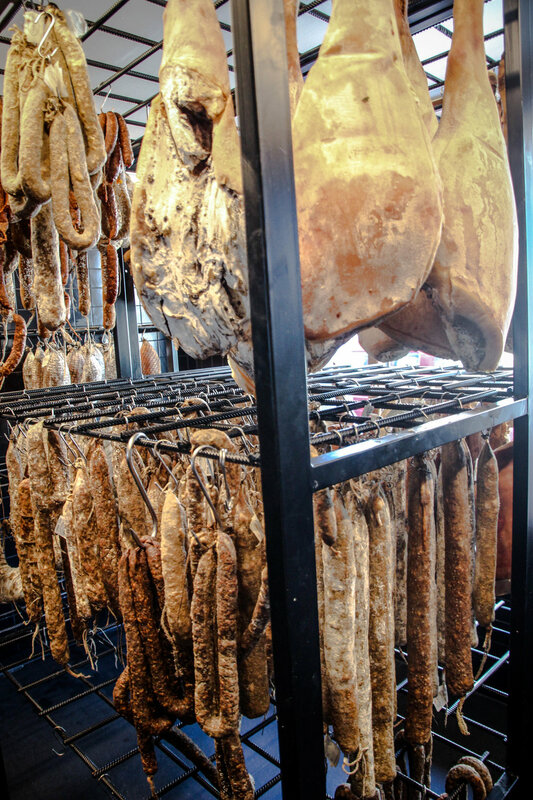 With some of these food preparing techniques, the cured meat take 24 months to rest and develop its flavor before it is ready to eat. The long waiting period adds an element of risk, but at Sårt they happily take that bold risk because they know that if they are meticulous, they can deliver a delicious final product. 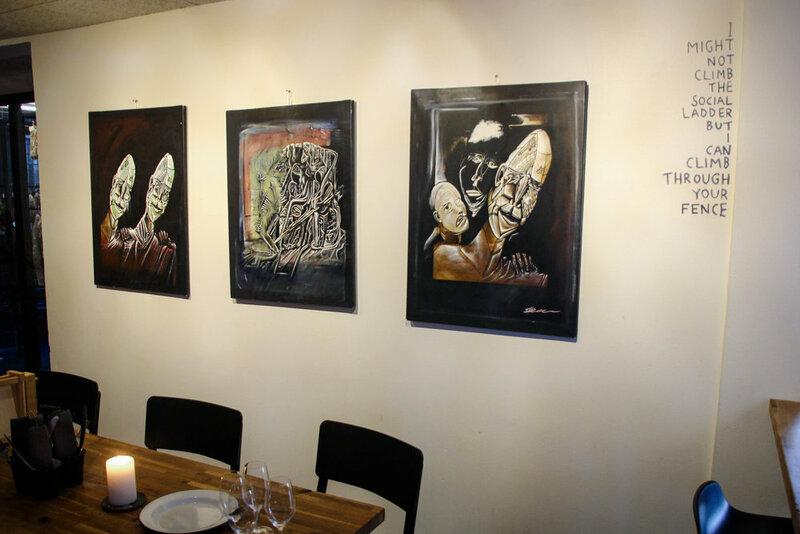 Moving onto the next stop, we paused to learn about a defining moment in the Aarhus "food scene". 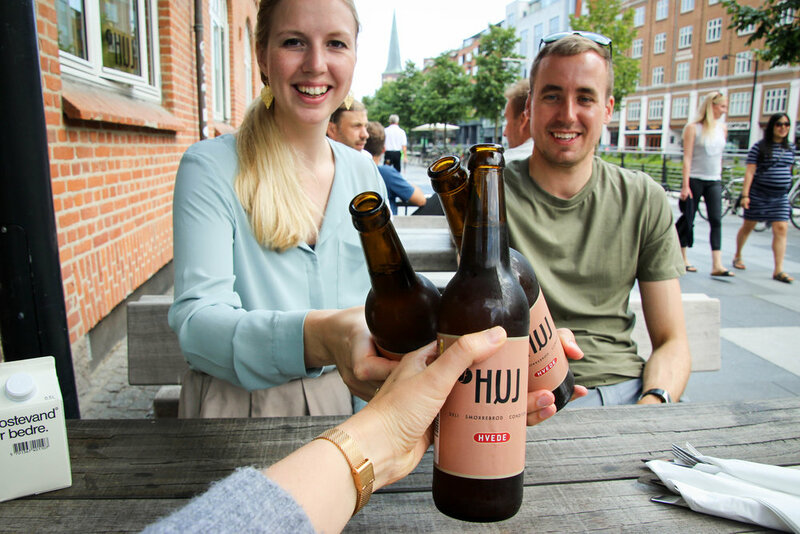 The 2008 economic crisis had reverberating effects throughout the world, and Denmark was no exception to its pangs. Businesses closed, particularly many high-end gourmet restaurants, which put top chefs out of work. Instead of re-opening these high-end restaurants once the economy started to stabilize, many of these top chefs decided to open smaller, more affordable restaurants. Many of the restaurants that we visited on the tour bloomed after the crisis, and it looks like they are here to stay. 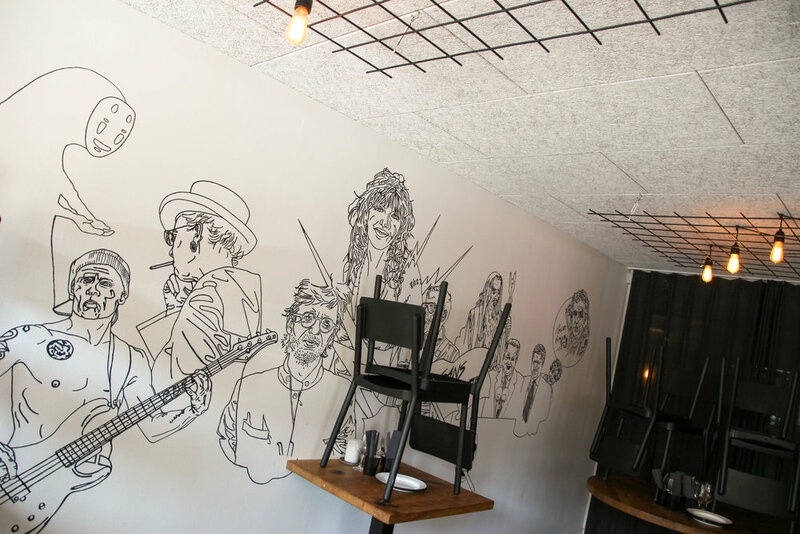 The opening of one affordable and trendy restaurant on a block catalyzed the opening of other trendy restaurants opening nearly. Eating out used to symbolize a very special occasion. Today, eating out has become very commonplace, and meeting up with friends is no longer limited to the comfort of homes. Moving on, we walked passed the city's canals, the ARoS Museum with its famous rainbow walkway, and stopped in the city park. In the park, David shared with us his homemade version of a summertime favorite in Denmark: buttermilk soup or koldskål. Using unpasteurized and organic buttermilk, he created an emulsion with eggs, vanilla, and sugar, which was paired with fresh raspberries and muesli. This is typically a summertime dessert, but I could also enjoy this as a sweet breakfast or afternoon snack year round! We then made our way through the Latin Quarter, the oldest quarter in Aarhus, which is now packed with hip restaurants and shopping stalls. Coffee lovers rejoiced at the opening of our next tasting, Great Coffee. There are only three siphon bars in the European Union - one of them is found right here in Aarhus. 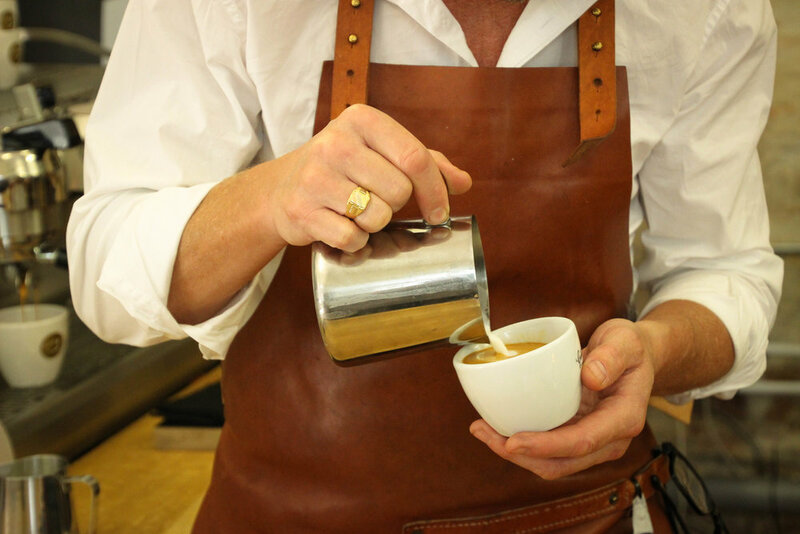 It also happens to be run by the award winning barista, Søren Stiller Markussen, who is the most famous barista in Denmark. 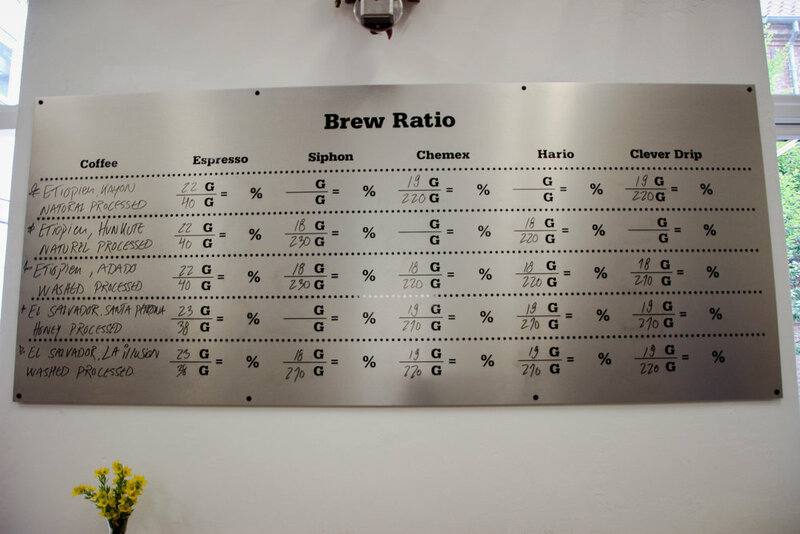 Great Coffee uses a $20,000 apparatus imported Japan, reminiscent of a chemistry lab, to make their siphoned coffee. Essentially, water vapor evaporates from the bottom globe and meets the grounds in the higher globe. After being stirred with a bamboo paddle, the pure coffee, free from any of the coffee ground's textures, are siphoned back into the lower globe. 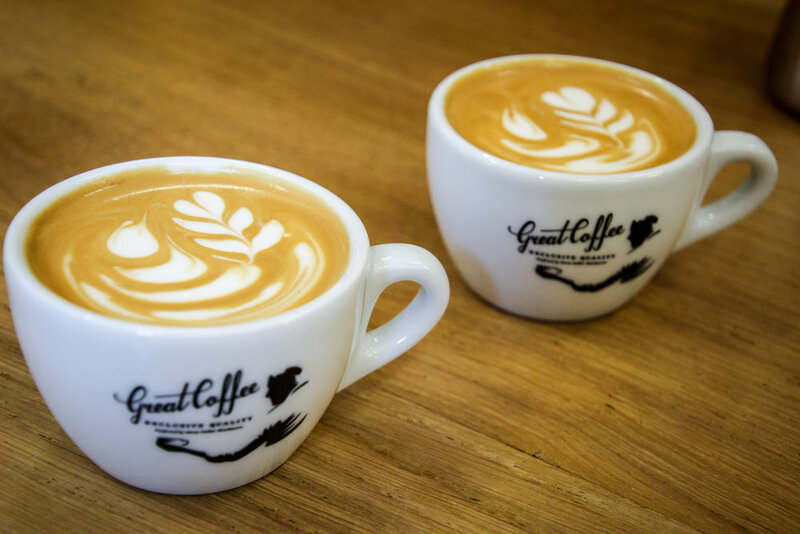 The flavor profile is robust and tasty making the perfect cup of coffee. It looks like a strongly brewed cup of tea, but do not be fooled - this is no average cup of coffee. 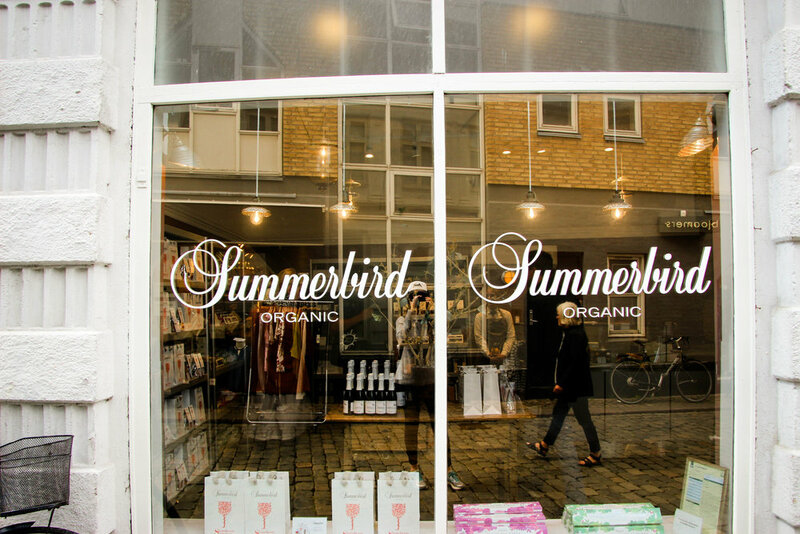 We finished the tour on a sweet note at Summerbird to taste hand-made Danish confections. Here I got to try my first flødeboller. These light and creamy puffs have been a part of Danish tradition for hundreds of years. The marzipan cookie, made from 75% Valencia almonds and 25% sugar, is topped with a foamy meringue and then a layer of Valrhôna chocolate. I tried the seasonal, summertime strawberry flavor, but they also had vanilla and licorice to choose from. This tour was sponsored by Food Walk, however all opinions, writing, and photos are my own.